The increase in median sales price of single family homes is being fueled by the increase in the number of transactions in the last 12 month period with an 11.3 % increase to 460 sales when compared to the previous 12 month period. In addition to the increase in the number of transactions and probably playing a bigger part in the increase in median sale price, is the lack of residential inventory. 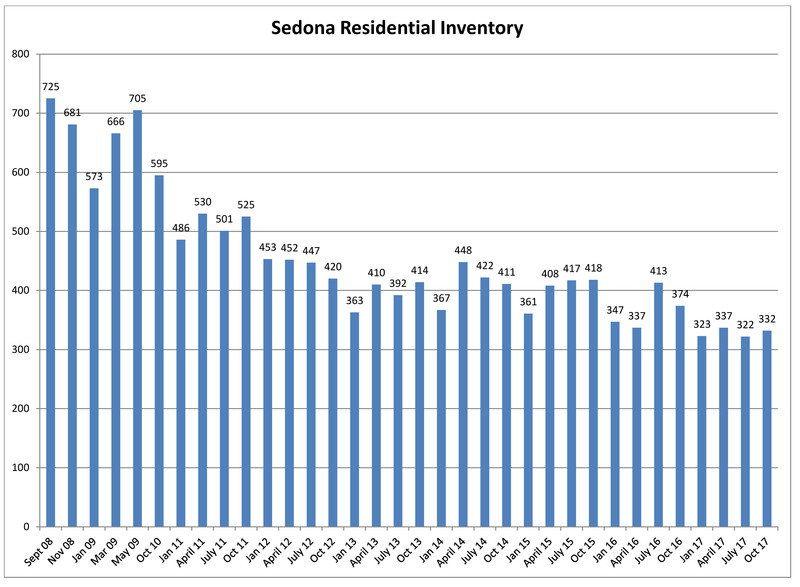 We have seen residential inventory in the Sedona area go from a high of 725 properties for sale in September of 2008 to bouncing around in the 330 range for the last 12 months. That is a 55% reduction in inventory of the last 8 years and about a 20% reduction in the last two years. Sedona and the Verde Valley are not the only areas experiencing a shortage of inventory; it is occurring all over the United States and is very acute in our feeder market California. Adding to the shortage is the extra pressure in the market from buyers. Millennials are entering the market in larger numbers, baby boomers are not only sellers, they are buyers too, there is increasing confidence in the housing market, and the fear of homeownership is fading, all contributing to the already short supply of homes for sale. In the last 5 years including year to date 2017, there have been 154 single family building permits issued in the City of Sedona. Interest rate are still hovering the 4% range but the consensus among those in the “know” will rise in 2018. Sales of homes over $1,000,000 in the last 12 month period saw a 200% gain from the previous 12 month period to 39 sales, this highest number in the last 10 years. 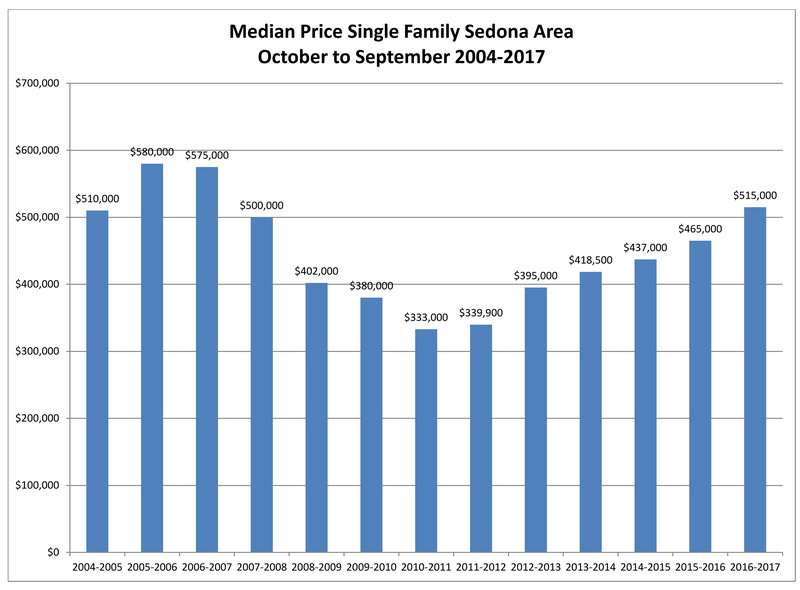 The median sale price of a single family home in the Sedona area is the highest it has been in the last 10 years. The median price of a single family home rose 10.7% in the last 12 months over the previous 12 month period to $515,000. The number of transactions rose 11.3% to 460 sales in the last 12 months. The median sales price through the third quarter of 2017 is at $515,000 an 11.4% gain over the third quarter of 2016. Vacant land transactions for the last 12 month saw a 25% increase over the previous 12 months to 144 sales. The median sales price took a nice gain of 8.6% over the previous year to $141,250. With the continued shortage of residential inventory I think we will see a gradual increase in the number of lot sales and a steady increase in pricing. The luxury market, over $1,000,000, is the strongest it has been in 10 years with 39 sales in the last 12 months, a 200 % gain over the previous 12 month period. With 34 homes for sale in the 1 to 1.5 million range and 21 sales year to date 2017, this segment of the luxury market is reaching a balance. Sales over $1.5 million are still a buyer’s market with over a three year supply of homes in this price range. The median sales price for Condos and Townhomes in the Sedona area posted solid gains with a median sales price for the last 12 months at $289,000 a 21% gain over the previous 12 months. The number of transactions in this segment jumped up 21% to 117 sales. The median sales price for single family homes in the Camp Verde area for the last 12 months rose 10.5% over the previous 12 month period to $210,000. The number of transactions grew to 109 sales in the last 12 months, up 12.3% from the previous 12 month period. The median sales price for single family homes in the Rimrock and Lake Montezuma area for the last 12 months rose 9.1% over the previous 12 month period to $179,000. The numbers of transactions spiked to 75 transactions a 29% gain over the previous 12 month period. It is interesting to note that as of this writing there are only 36 homes for sale in the Lake Montezuma/Rimrock area making this area the strongest seller’s market in the Verde Valley. The median sales price for single family homes in the Cottonwood and Cornville areas for the last 12 months rose 11.8% over the previous 12 month period to $245,000. The number of transactions for the last 12 months is up 8.4% to 541 sales. The median sales price of $245,000 is the highest median sales price in the area for the last 10 years, only topped by the boom years of 2005 and 06. The Bottom Line: Expect inventory to be in short supply through 2018 and maybe longer. Demand should continue to remain strong as buyers regain their confidence in real estate and there is overall strength in the economy. Interest rates should stay in the 4 to 4.5% range for the rest of this year but will probably rise in 2018 especially if the feds put in place another rate hike or two. Overall it is a seller’s market and will continue to be so into the foreseeable future.